Ever swallowed some food and it didn’t go down right? You started to choke and your eyes even watered? Think of yourself as a car. And the food is the fuel. Well when your fuel filter gets clogged, as in your throat, you can’t breathe right. That’s your fuel filter. It keeps all the particles that flow through your fuel system. Your gas tank isn’t always clean as you think it is. After years of use, all sorts of debris can settle on the bottom of the tank and all that debris will eventually work its way up through your fuel lines and up to your injectors. And injectors are not cheap! So get your vehicle into Elkhart Mechanics right now to make sure the fuel is flowing properly. The purpose of a fuel filter is to remove debris from the car’s fuel system, specifically from the fuel injectors, where the debris would do the most damage. A clogged fuel filter puts additional strain on the fuel pump. Cars made before 2003 have an external fuel filter that is visible if you look under the car, but in most newer cars the fuel filter is inside the fuel tank. If your car’s fuel filter is inside the fuel tank, then the only way to replace it is to replace the entire fuel tank. This is unfortunate, because fuel filters become clogged by debris over time and need to be replaced after about 100,000 miles. An external fuel filter is fairly quick and inexpensive to replace, but replacing the fuel tank is a major repair. In response to this problem, the newest Honda, Nissan, and Toyota models have a fuel filter which is located inside the tank but which can be replaced without replacing the entire tank. 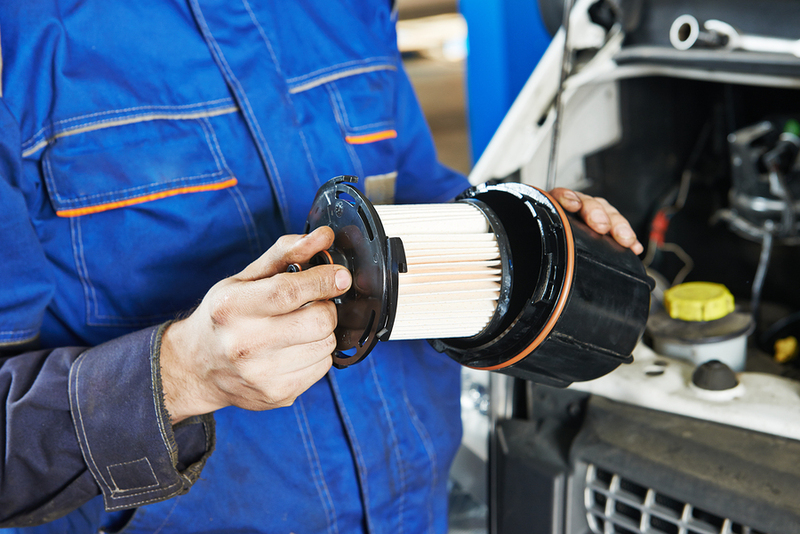 One sign of a problem with your fuel filter is a vehicle that loses power when you drive uphill. A fuel filter that needs to be replaced can lead to other problems which might cause the check engine light to turn on. If your check engine light is on, the next step is to do an engine diagnostic. We will carefully inspect all the parts where the engine diagnostic test identifies problems, and we will not replace parts that are still functional if the problem could be corrected by replacing the fuel filter instead. Fuel filter problems can also mimic transmission problems. How complicated it is to replace a fuel filter depends a lot on the kind of car and when it was made. If you have any questions about your fuel filter, just ask us.